Posted on April 3, 2019 by Jessica T.
Typically, I don’t enjoy reading nonfiction. I’d rather immerse myself in a fictional world and befriend imaginary characters. However, Bryan Stevenson (a renowned lawyer), really blew me away with his work Just Mercy. In this book, he recounts many of the cases him and his nonprofit organization, EJI (the Equal Justice Initiative), have taken on. His work focuses on the injustices and flaws of our country’s justice system, such as the death penalty, incarceration and the juvenile justice system. The book’s plot is centered around the case of Walter McMillian, a black man falsely accused of a murder he didn’t commit and placed on death row, but includes a number of other cases Stevenson took on. Throughout the book, Walter McMillian’s conviction is totally turned around and Stevenson describes the long, difficult fight to free a black man in Alabama. Stevenson represented a wide variety of victims, including women and children. Along the way, he includes many facts and statistics about the cruel, seemingly unconstitutional or immoral rulings and laws passed in the 1800s-2000s. These facts surprised, outraged and educated me. He discusses how white judges and law enforcement officials in southern America did everything in their power to oppress African Americans, how children were subject to unforgiving punishments and how these injustices didn’t only hurt these individuals, but everyone around them. Stevenson does an excellent job incorporating his own emotions and thoughts into nonfictional accounts. By doing so, Stevenson makes his work interesting and easy to follow. However, the book is an emotionally taxing read. He discusses cases and victims that suffered horrendous abuse, mental illnesses and punishments. There were times I had to put the book down and I would be in a state of disbelief or sorrow. The autobiographical work is heartbreaking, yet encouraging. It is motivating to know that there are people like Stevenson who work to defend helpless victims against the power of the State and country. It is empowering because now, I feel more aware and educated about the country I live in and its response to crime. It’s an important read, especially for young people. I definitely recommend this book to everyone because of how eye-opening and powerful it is. 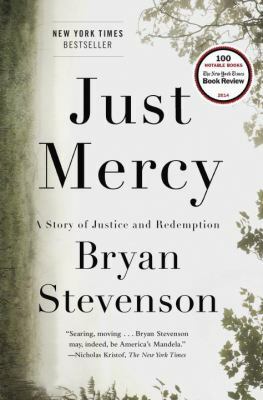 Just Mercy is available for checkout from the Mission Viejo Library. It can also be downloaded for free from Overdrive.